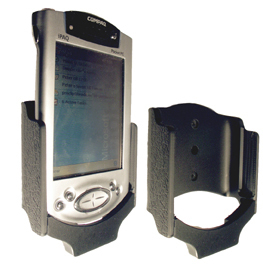 For Compaq iPAQ 38xx in all countries. For Compaq iPAQ 39xx in all countries. For Compaq iPAQ 54xx in all countries. For HP iPAQ h55xx in all countries. Attention! 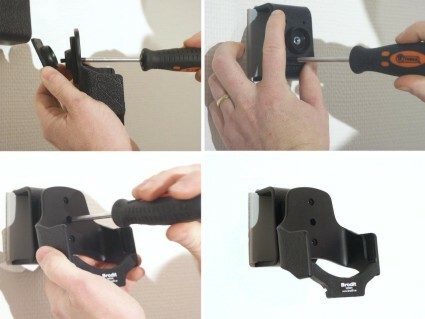 Read all instructions and look at the pictures before attaching the holder. You can choose to have a standard holder (recommended for normal use) or a holder with locking and release buttons (recommended if driving on a rough road). 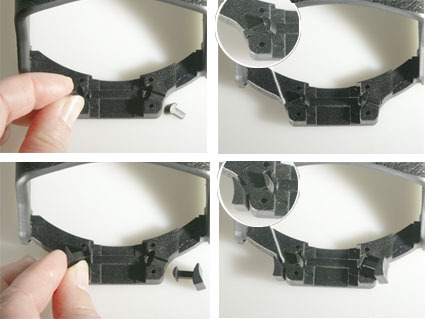 Enclosed are plastic pieces for both options, it is important to attach them correctly (see pictures). 1. Place the holder with the frontside downwards. Press the enclosed two small plastic pieces (the smallest ones) into the grooves on both sides of the opening in the holder. The larger ends of the pieces should point into the opening. If you prefer a holder with locking, use the larger plastic pieces. 2. Press on both sides of the connector on the cable, so the notches go into the connector. Place the connector, with the arrows facing up, into the opening in the holder. Place the back piece over the connector and screw it onto place with the enclosed screws. The cable is in place. 3. 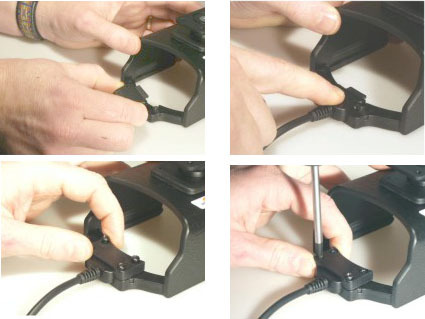 Loosen the screw in the center of the holder so you can remove the attaching part on the back. Place the attaching part on desired position. Screw the attaching part into place with the enclosed screws. Place the holder over the attaching part. Screw the holder onto the attaching part. The holder is in place. 4. 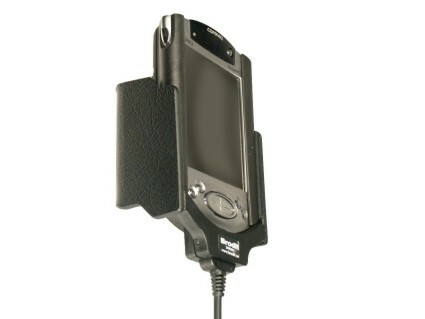 The holder with a cable connected to it, and with an iPAQ in place.